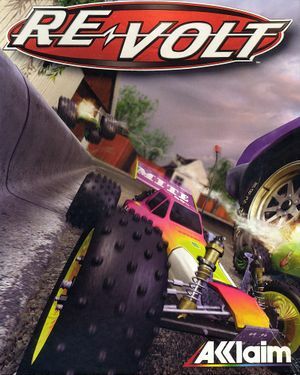 For the unrelated 2016 game, see Revolt (2016). 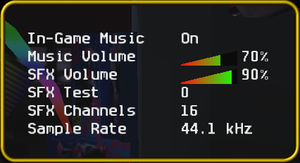 RVGL is a cross-platform rewrite/port of Re-Volt that runs natively on both Windows, Linux and Android. Open-source Windows, Linux and Android port. Three official patches were released: v1.0, 0916, and v1.1 (1207). This pack includes Rooftops and fourteen additional cars. Allows for the creation of fully-custom tracks of comparable quality to those in the original release. FutureCars is a Re-Volt mod including custom cars and tracks which replaces existing Re-Volt gameplay with high speed, "ultra grav" vehicles, reaching in-game speeds of up to 100 mph. The mod currently includes seven custom tracks, and 20 unique vehicles. Use RVGL and toggle with F11. Use RVGL on Windows 8 and later. Create a shortcut to rvgl.exe and open its properties. Add the -aspect <width> <height> <fov> command line argument. Default FOV value is 512. 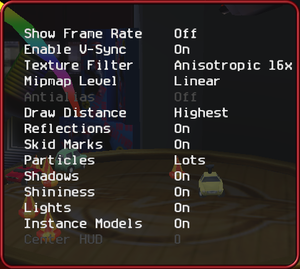 Lower values give a wider FOV in-game. Example: -aspect 1920 1080 300. Use RVGL to add support for modern controllers. Use RVGL. 16 Cars and 8 spectadors. There are a number of issues with the game's multiplayer mode, including crashing and object inconsistencies, as well as bad syncing and bad starts, often preceded by a hang at the loading screen. Saving replays also often results in a bug. There is currently no known fix for any of these issues. This applies to the GOG.com version. Delete or rename winmm.dll in the installation folder. This allows the user to change the top speed, acceleration, steering rate and wheel size, as well as detailed vehicle dynamics settings, effectively allowing the user to 'tune' the vehicle. Enter any sub-folder with a car in it. Edit the vehicle parameters in the parameters.txt file.